Now CEO of Talmetrix, a Cincinnati-based employee research and data company, Powell firmly believes that organizations are human systems -- not machines -- and they should be managed accordingly. 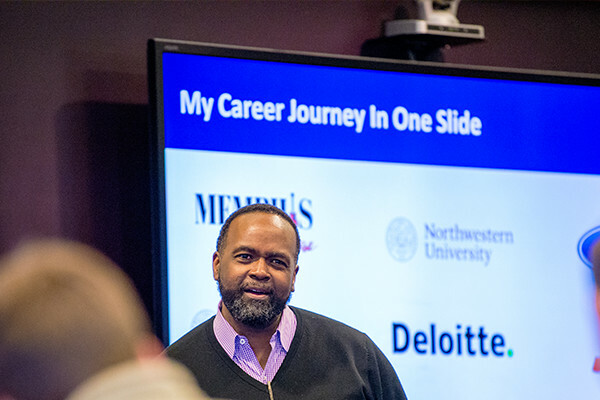 Powell passed on his philosophy, along with solid career advice and wisdom gleaned from 20 years in the trenches of human resources when he recently spoke to Mindy Douthit’s advanced Studies in Organizational Change class. Take good care of your employees. Then they’ll take good care of your customers, and the customers will come back. “Working with people makes human resources an art rather than a science, and it needs to be treated as such,” he said. Don't 'do' leadership. At Scripps Networks, Powell focused on spin-offs, rapid growth, and international expansion while experimenting with his own philosophies on how to facilitate and support growth. “I discovered a lot of leadership development programs were teaching people how to ‘do’ leadership. But you don’t ‘do’ leaders; you are a leader. To create better leaders, we developed a mentoring program, as well as new management training and leadership training. Learn more about the Learning and Organizational Change undergraduate program at Northwestern. Learn more about the Master's in Learning and Organizational Change program.